UPDATED 12-14-2017: National Press Club Speech - November 10, 2017: New Age, Javier Solana factors in "Global Governance"
December 13, 2017 Update: Please don't call me unqualified to discuss this topic. 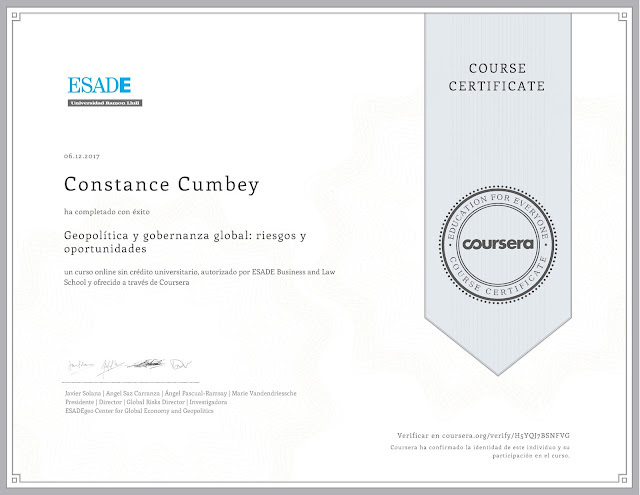 This certificate says I have successfully completed Dr. Javier Solana's taught ESADE University Coursera course in what else?, global governance. There was a wealth of videos, background papers, most of which presented no small challenge to me as they were in Spanish. However, Google has come a long way with its translation software and I made it through. Students were required for course passage to grade the papers of 3 others. Each final examination was graded in turn by 3 students. Two gave me perfect scores. The third grading me knocked me down a little, but still, I finished the course with a 90.3% grade. Not bad in my humble opinion. Thought you would enjoy seeing my newly found credentials in how to run our world, better known these days as "global governance." Talk about going into the "belly of the beast" figuratively speaking! The course tuition was an extremely reasonable $29.00 and I more than got my moneys worth. I figure this combined with my law degree, 42 years of practice, 37 years of research and writing on the topic, plus 22 years (since November 22, 1995) intense research on Javier Solana and "global governance" more than qualifies me to speak on the topic, even though I gained most of my information "the poor man's way" through computerized research rather than flying to expensive international conferences. I have to say that the course was well done and well worth the $29 I spent! There were six weeks of hard course work, but I got it accomplished in approximately 2.5 weeks. 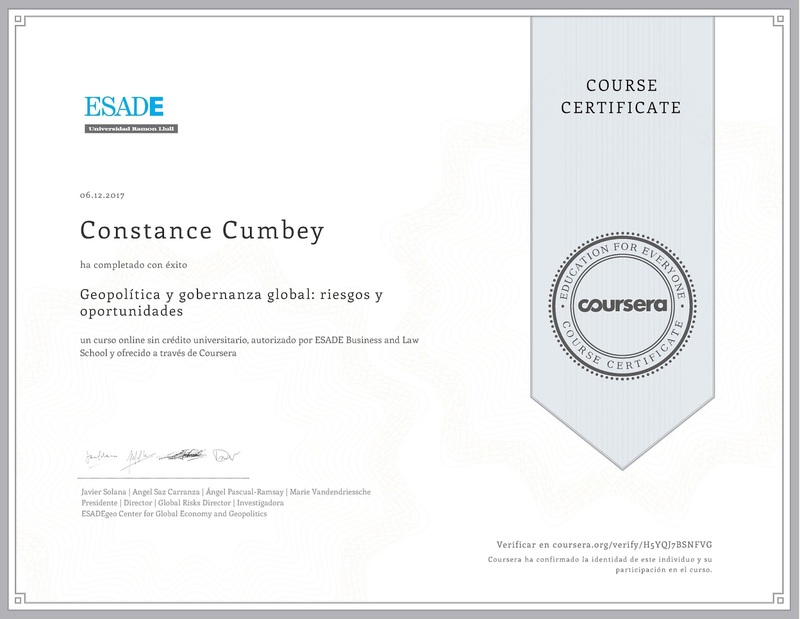 My course certificate from Esade/Coursera for Global Governance & Geopolitics - Risks & Opportunities. Original blog posting: Well, I keep getting these surprises just before bedtime. Cliff Kincaid just forwarded me a link to the speech I gave at his Washington, DC conference on "Russia-Gate" on November 10, 2017 at the National Press Club, Zenger Room on that date. I wish I had smiled more for that presentation or had been a few years younger when I was a bit more photogenic, but what you see is what you get! My presentation centered about major factors and a major player in global governance circles -- Javier Solana and family New Age family ties in his relationships. For what it's worth, here it is. I hate to watch my own videos and listen to my own audios, but Cliff and Jerry Kenny do a first rate job of presenting the material. Here it is. I was able to download the video for my own archives from Youtube and because of the constant "Now you see us, now you don't" approach I have found those advancing the various New Age/Global Governance agendas, you might want to download and save it to your own archives. Cliff has asked me to circulate this, so here it is. Of course, as always I value your feedback. Stay tuned!